This tour begins near the top of Park Slope’s infamous slope and works its way down to the gritty bottom of the Gowanus Canal. Okay, maybe we shouldn’t go that far down. We’ll stop above the canal and look upon it wistfully. We will start with a basic history of Park Slope, and then it’s off to the races… food, vaudeville, subways, baseball, shantytowns, Prohibition, and gangsters will all be making appearances on this whirlwind adventure. At each stop, you will be shown images of the past which will transport you in time. The tour will culminate near several bar and restaurant options. Please note: This tour is intended for adults, not children. There will be around 20 city blocks of walking, so it is recommended you wear comfortable shoes and bring sunglasses, sunscreen and water. Please arrive 5-10 minutes early to help us start and end on time. Over 600 buildings in the Brooklyn Heights Historic District pre-date 1860. In this tour, we will touch on topics such as the American Revolution, the Underground Railroad, the Brooklyn Bridge, and the world’s oldest underground subway tunnel. You will visit the oldest house in the neighborhood - which very few people are aware of - and the prior homes of some incredible celebrity residents. We’ll end the tour near a historic watering hole where you’ll have the option to imbibe the “spirits” of the many longshoremen who came before you. 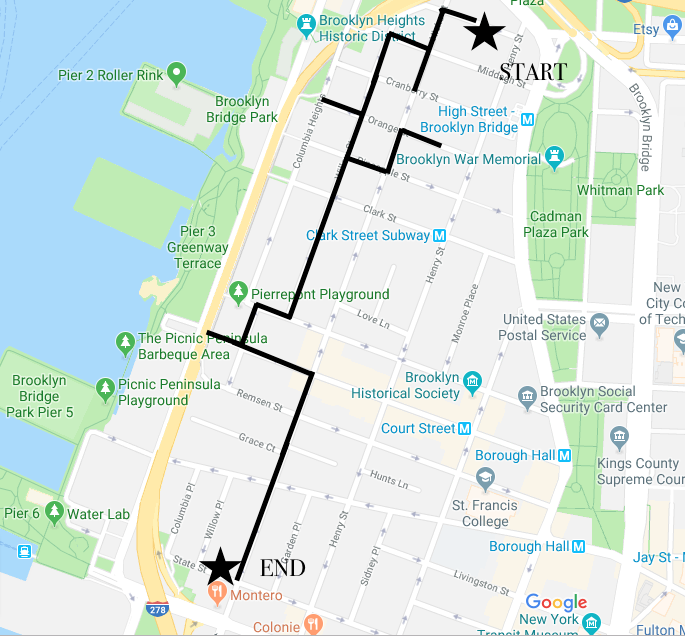 *This tour begins in front of Litchfield Villa on Prospect Park West between 4th and 5th Street (closest train F/G at 7th Avenue) and ends at the Carroll Street Bridge (closest train R at Union Street, F/G at Carroll Street or trains at Atlantic Center). *Tour begins at 64 Poplar Street (closest trains A/C at High Street or 2/3 at Clark Street) and ends at Monterro’s Bar and Grill (closest trains 2/3/4/5 at Borough Hall).